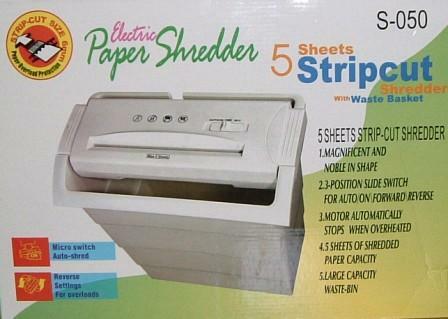 We were getting a paper shredder, did not like the high retail prices so bought this batch wholesale. They are UK mains operated, have a waste paper bin and (the clincher for me) are "magnificent and noble in shape" according to the manufacturer. It is a strip cut machine so makes 6mm strips rather than confetti, takes 5 sheets at once and has a forward and reverse motor. The reason we wanted one is that, apparently, even a name and address on mail is useful to identity thieves. This got us spooked as masses of junk has name and address on it, and it would not take much to rummage up a profile of who is at an address. The need for these things is more than irritating, but they are quite fun to use. If you would like a "magnificent and noble" paper shredder simply order. paper shredder with bin text, images and video are copyright.